Are mobile phones not making these redundant? Interesting you should post this now. 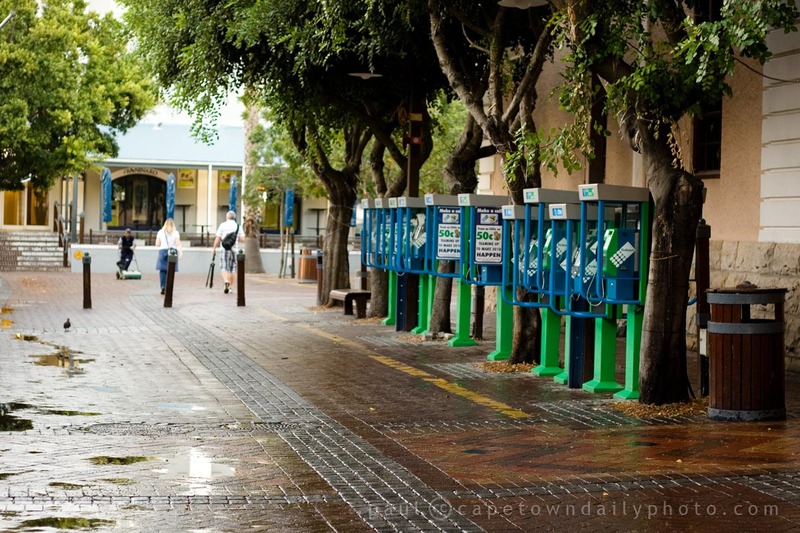 I just took a photo of a man at some public phones a few weeks ago in Hermanus. It struck me at the time how few you see these days, with virtually everyone having a cell phone. it is funny. I’ve done the some photos, exactley the some, from the some angle. and another one of a man on the phone like the Steve ones. I’m very keen on this blog because I had the opportunity to know so many views of Cape Town that I didn’t know and after seeing the photo, I always went to see the place in person. Thank you!!! AB, I guess that they are being used less. This pic was taken at the crack of dawn, hence why you don’t see anyone using the phones – but if I think about it, I do often see folk using them. One thing that we’ve found is that very low-cost technologies such as mxit are making communication very affordable. Check out the article here. Steve, nice one! Did you manage to catch one of him talking on the phone? Cristina, did you post your photo somewhere that we could see it? And, tell me, do you find that you even use the links to maps that I sometimes include in the article? I’m very curious and I open all the links of the article you write, they are always very interesting and very useful for me. No, unfortunately not. I missed him trying to use the card phone. Just after I took this I heard one of the other stallholders directing him to another one some way away. I guess that one or both of them were not South Africans as they spoke English to one another. Probably from up north somewhere. I actually used one of these using a card to phone back to the UK on our first ever visit to Cape Town some 4 years ago – they have a well cared for look to them.. I just posted a photo I took of that same alley; only from the other end and at night. That’s a pretty cool photo Steve. Nice work!